On Friday, I took a 40-minute trip with my friend Laurita to Magdalena Teitepac in the foothills on the other side of the Carretera Nacional Mexico 190 (aka Panamerican Highway) for the purposes of textile shopping, always my favorite past-time. 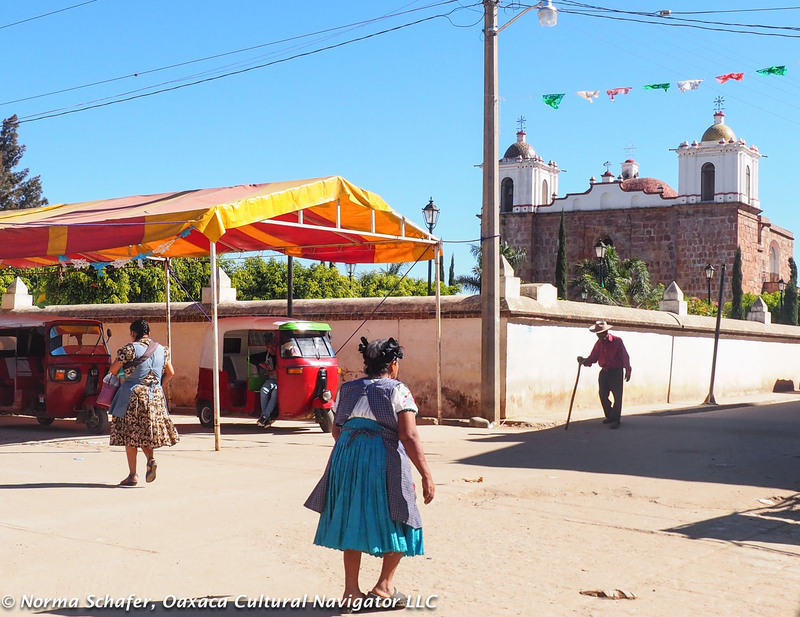 The Zapotec village is beyond San Juan Guelavia, the basket-making village. 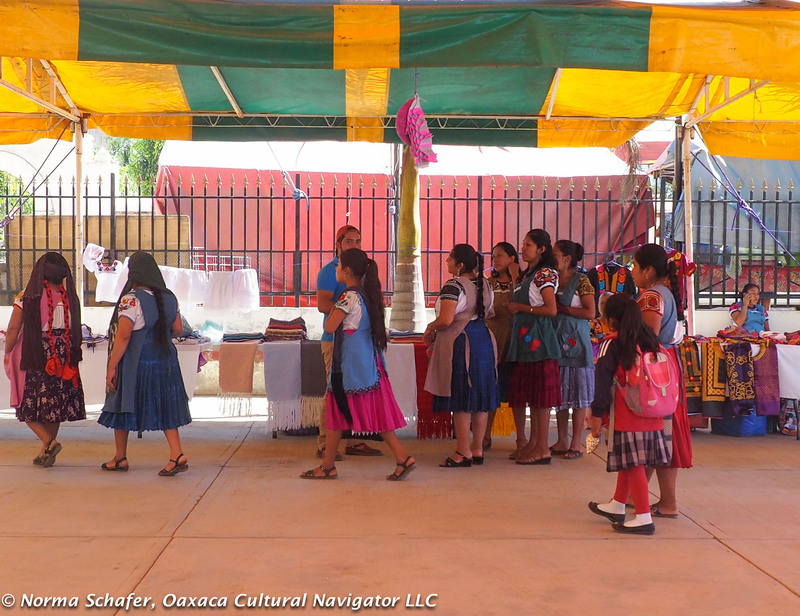 A group of entrepreneurial Magdalena women who do needlework staged this First Annual Embroidery and Weaving Fair, promoted with a banner hanging from the highway overpass. Laurita spotted it coming home one day. Can you tell if this beautiful embroidery is hand- or machine-stitched? 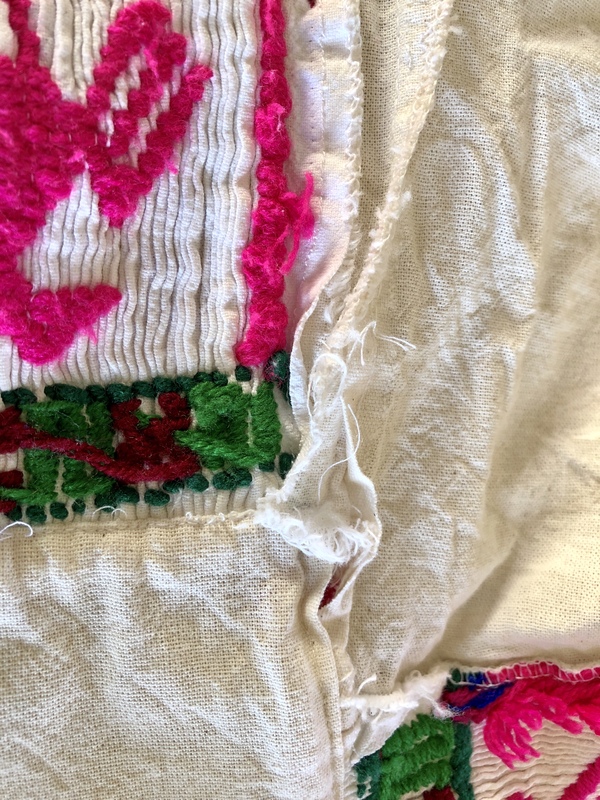 The visit got me thinking about quality variations in clothing that is sewn, embroidered, woven and crocheted here in Oaxaca and throughout Mexico. Some of the women showing us their needlework blouses. 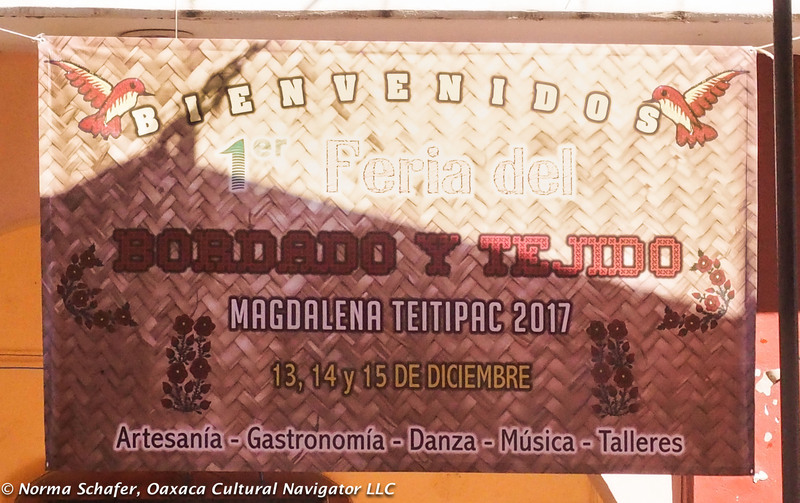 We are coming into Oaxaca’s peak tourist season when travelers come from all over the world, and many snowbirds plant their wings here from December through March. 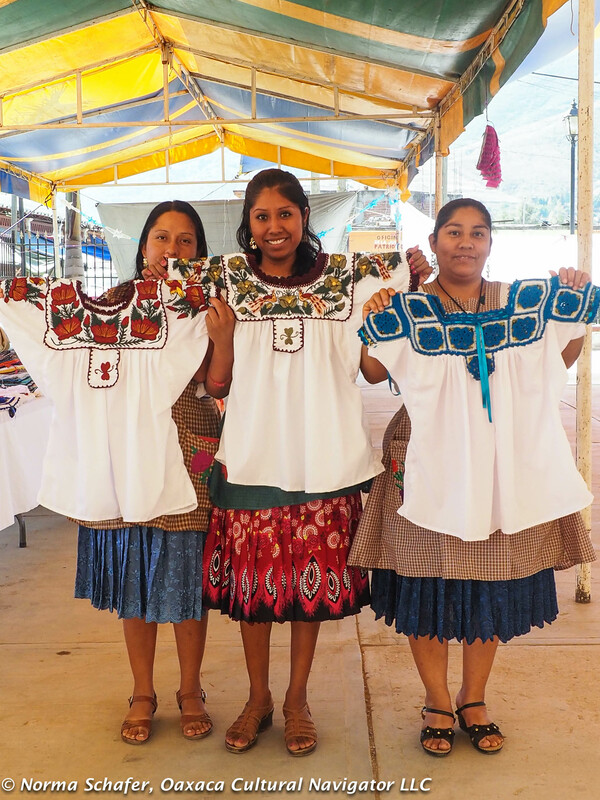 It is particularly challenging for first-time visitors who are blown away by the quantity of blouses, huipils, rebozos and other garments sold by street vendors, in small markets, and in tourist shops throughout the city. How do you know what to buy and how much to pay for it? Tip #1: Shop around. Look before buying. Look at lot. Go in and out of stores. Stop and look at the clothing the vendors have for sale. Ask prices. See what you like. Take your time. Tip #2: Turn the garment inside out. 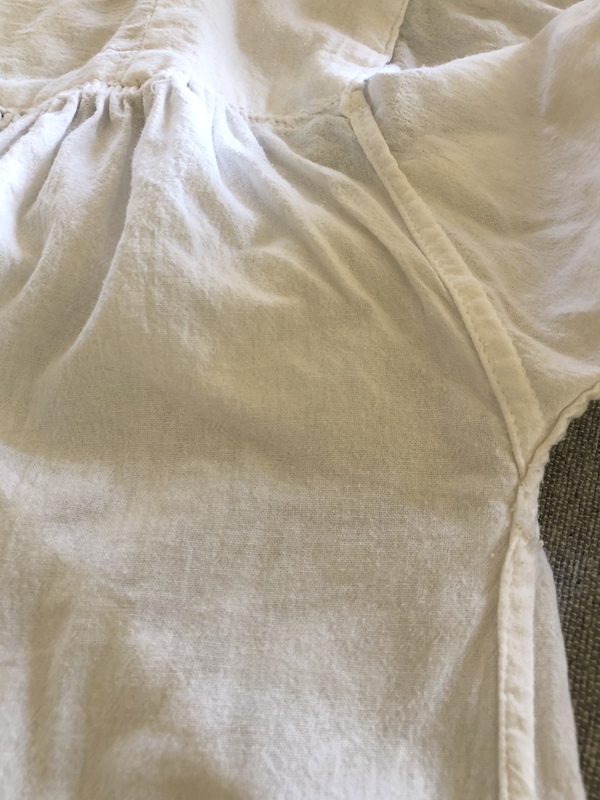 Look at the seam edges of the cloth. Are they finished with a machined zigzag stitch or serger for reinforcement? Has the cloth edge been trimmed with a pinking shears? It is rough and will it unravel after a few washings? How strong are the stitches? Tip #3: Check out the fabric. Is it populina? This is what locals call the commercial cloth mix of cotton/polyester blend. Locals like this cloth because it dries much faster than pure cotton. It is also less expensive. Is it manta? This is 100% cotton cloth, more expensive, and preferred by many of us for softness, wearability and comfort. Populina has a sheen. You can feel the polyester. Tip #4: Check out the cloth again. If it’s manta, is it a fine, lighter weight weave or it is coarse and scratchy? Is it yellow color or white? What are your preferences? #whomademyclothes .... is a Fashion Revolution movement dedicated to sourcing textiles direct from makers, awareness for buying disposable clothing made from cheap materials, assembled by underpaid workers. 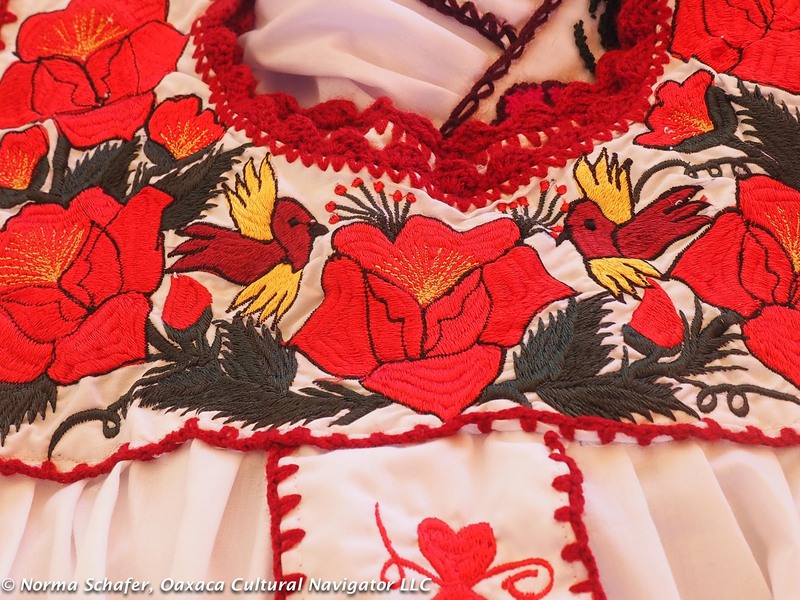 Tip #5: If the clothing is embroidered, how fine is the embroidery? Is it by hand or machined? Are the stitches dense or loose? What about the crochet edge? Is it tied off or are there loose threads? 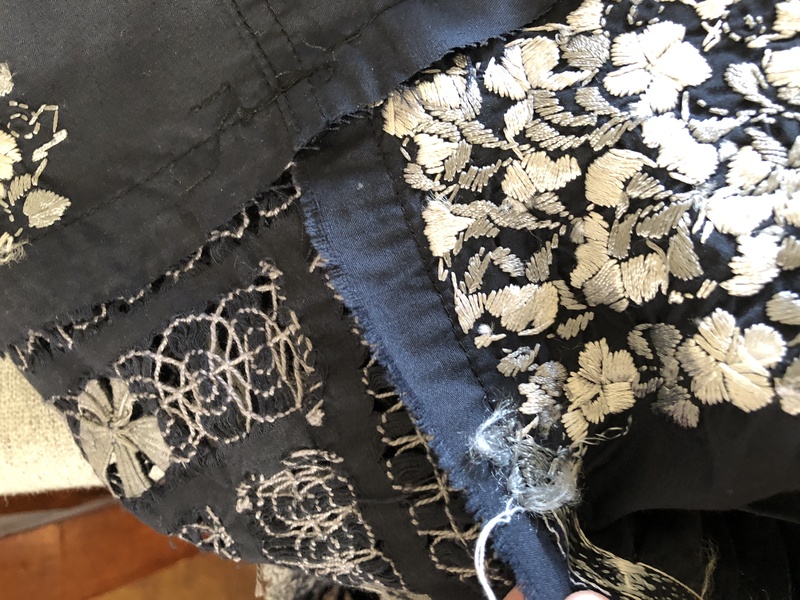 Is it shiny, synthetic thread, dense/coarse polyester thread or good quality cotton? 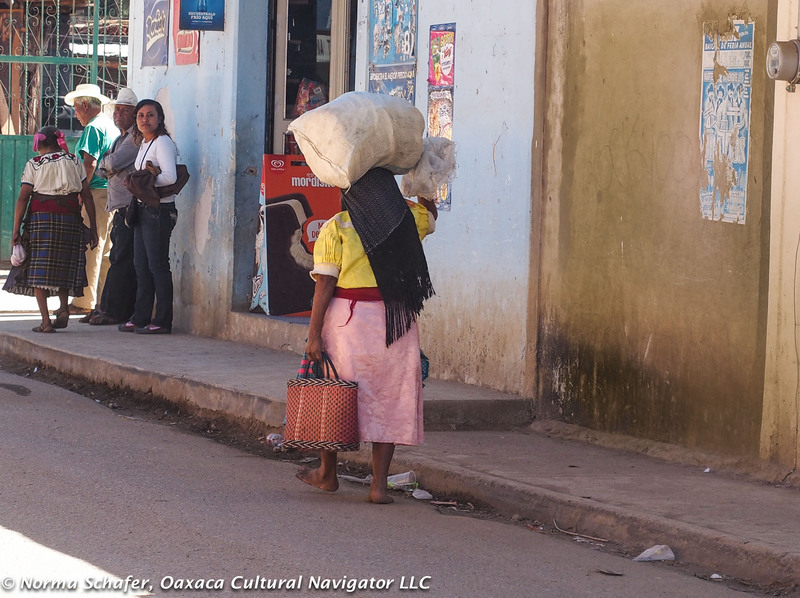 Tip #6: Shop first in some of the better clothing galleries like Los Baules de Juana Cata or Arte de Amusgos to compare what you see on the street. See what the best looks like. Turn these inside out. Look at the finish work. Are the edges straight? 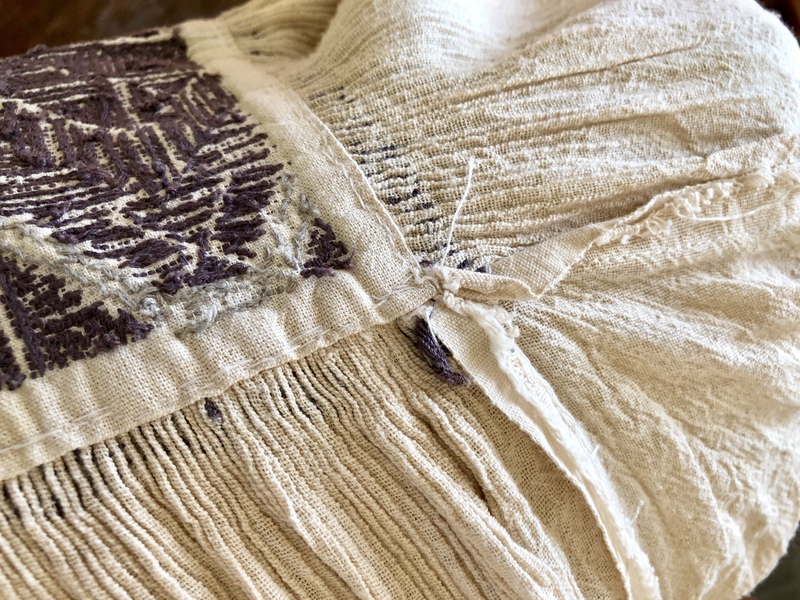 What about the stitches that join two lengths of hand-woven cloth together? How is the neckline finished? What about the hem? Want to buy direct from artisans? Take a study tour! Tip #7: Price is usually based on quality, but not always. I recently bought a beautiful deshillado and embroidered blusa in San Antonino Castillo Velasco. I paid 2,500 pesos, quite a lot! The embroidery is exquisite and the crochet edges are fine. The seams are not finished well and I may need to take it under the needle of my sewing machine to reinforce it. But, I knew that when I bought it. What are you willing to pay? What is it worth to you? Is there a whimsical design you like and you are willing to sacrifice some of the quality issues? Tip #8: Don’t hesitate to walk away because you notice stains on the cloth, raveling threads or holes in the seams. Work is done quickly and quality can suffer. I’ve seen excellent work done on very poor cloth. I’ve seen embroidered, beaded and woven pieces made by one women that are attached to cloth that doesn’t match. Needlework and sewing can often be made by two different people. The sewing can be haphazard. The corners don’t match up and the joining work isn’t good. It is up to us to educate ourselves and to also say in a gracious, caring way, that we would like a better quality product. 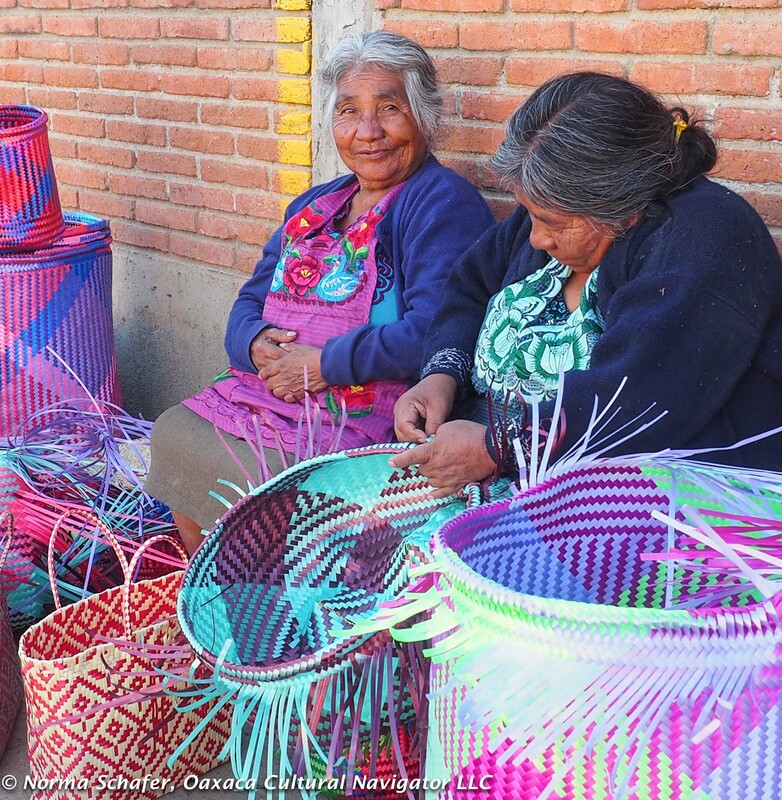 We can support artisans and cooperatives who take the time to work on quality improvement. Tip #9: When is a bargain not a bargain? When the color bleeds. When the seams unravel. When the embroidery stitching loosens. When you get it home and ask, Why did I buy that? Did I buy anything in Magdalena Teitipac? Yes, a lovely, beribboned apron for 100 pesos and some amazing artisan chocolate from Tlacolula, 20 pesos a bag. Why didn’t I buy a blusa? 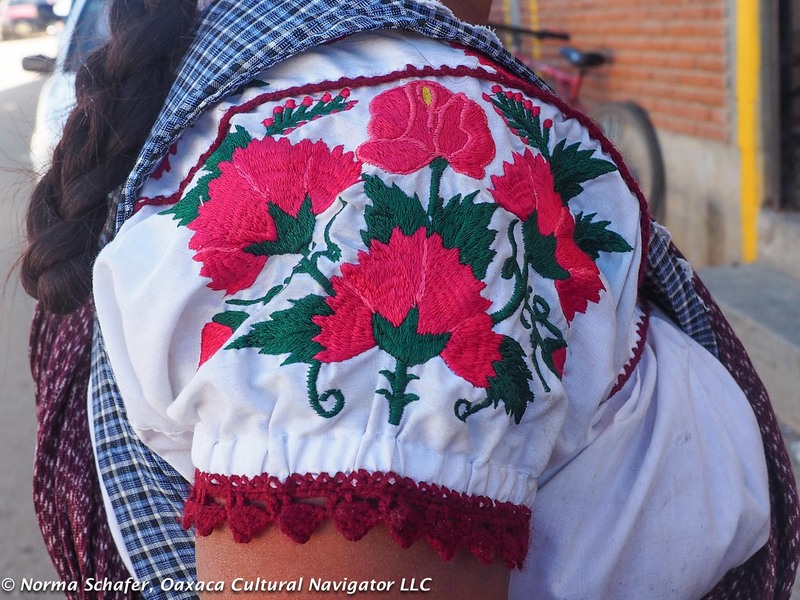 Because indigenous women here in Oaxaca like their blouses tight across the chest and snug under the arms. Sizes are deceiving and it’s best to try something on first, otherwise you can get it home and find out it doesn’t fit. Nothing fit me! Cooperatives working with NGOs on product improvement are receiving education about quality control, making finished seams,and patterns to fit women from the U.S.A. and Canada. If you have any tips you’d like to share, please add them. Of course, the final caveat is always — if you love it, buy it. You’ll never see the same thing again!